“We’re using a well-known and highly-controversial sporting event to show students how mathematicians, scientists and engineers think. We want to engage students in problem solving and allow them to come to their own conclusions. 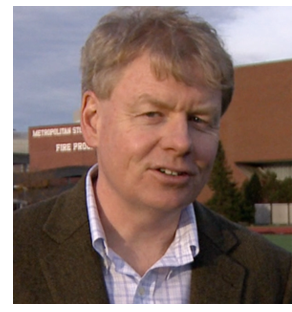 Regardless of what they decide, Deflategate is an excellent science lesson because it illustrates how the laws of physics can apply in real world situations.” This is how MIT Engineering Professor John Leonard describes his BLOSSOMS lesson, “Temperature, Pressure and American Football: An Introduction to Gay-Lussac’s Law.” This lesson places the phenomena of Gas Law behavior into a recognizable context—sports—thus demonstrating to students the social relevance and importance of science. It provides a great opportunity for students to apply critical thinking skills to an important real-world scenario – can the halftime measurements of the Patriots’ footballs be explained by basic physical laws? Following are three important learning objectives of this new BLOSSOMS lesson: 1) to define Gay-Lussac’s Law, and to use it to predict how the pressure of a fixed container of gas, such as a football, will change due to an increase or decrease in temperature; 2) to compare predictions from a physical law with experimental measurements of the same quantity; 3) to introduce the concept of measurement error and to discuss sources of uncertainty in pressure and temperature measurements. You can watch the lesson here. What do rocks and pizza dough have in common?Can a liquid resist the blow of a hammer? Do earthquakes work like sling shots? Do you live near an active fault, and know how to prepare for an earthquake? Young scientists from academic institutions across the United Kingdom and Germany have joined together to explore these questions through a series of hands-on, interactive, and inquiry-based science learning videos. In their lively presentations, these scientists translate seemingly abstract concepts into easily accessible, practical and potentially life-saving information. The videos are designed to be used as educational tools by high school teachers to engage their students in observation, experiment and discussion of geoscience concepts. The learning content is based on materials developed and tested by the ParsQuake Project and Teachers Without Borders. The unique teaching duet pedagogy is modelled after the approach developed by MIT BLOSSOMS. This project is supported by the European Geosciences Union 2016 public engagement grant. The videos will be available for free download and viewing at http://parsquake.org/ in February 2017. They will also be available on the MIT BLOSSOMS website. Starting in January 2017, BLOSSOMS will play an integral role in a research study entitled, “Evidence Based Education Based on Data Analytics – Moving towards a 360 View of the Student.” This research initiative will be conducted by the Hong Kong University of Science and Technology - MIT Research Alliance Consortium. It will study the formal modeling of quality measures during the teaching/learning process. An important objective of the research will be to develop data mining techniques to capture the learning patterns of students with different backgrounds. Louis Cammarata, a first year Masters student in MIT’s Technology and Policy Program (TPP), is one of three MIT students involved in MISTI’s Global Teaching Lab Program in Jordan. 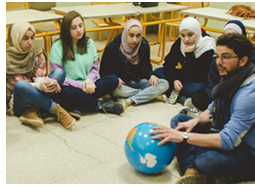 He teaches 10th graders at the Jubilee Institute, a high school for gifted students in Amman, and through a series of hands-on workshops, drives the students to investigate randomness, its occurrence and how it may be leveraged to address real-life issues. Louis reports that he has used several BLOSSOMS lessons to build his currciulum and to provide ideas, materials and teaching advice. Activities inspired by BLOSSOMS lessons include studying random triangles with spaghetti, rolling dice to understand epidemics, introducing Monte Carlo methods with rice, and more! He writes that “teaching is a great way for me to reciprocate the wonderful educational experiences I have had so far” and is “very thankful to MISTI for offering me this opportunity” for “cross-fertilization” among cultures! Ann Lambert, a chemistry teacher at the King Philip Regional High School in Wrentham, MA, has been teaching high school for 19 years. For the past 6 years, she has also been a Lead Teacher at Beyond Benign in Wilmington, MA, an organization dedicated to providing future and current scientists, educators and citizens with the tools to teach and learn about Green Chemistry in order to create a sustainable future. 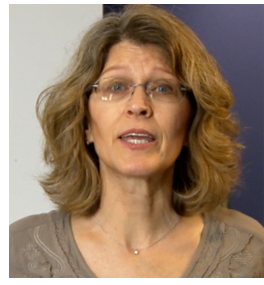 Ann’s lesson introduces students to Green Chemistry, the design of chemical products and processes that reduce or eliminate the use and/or the generation of hazardous substances. Watch her lesson here.